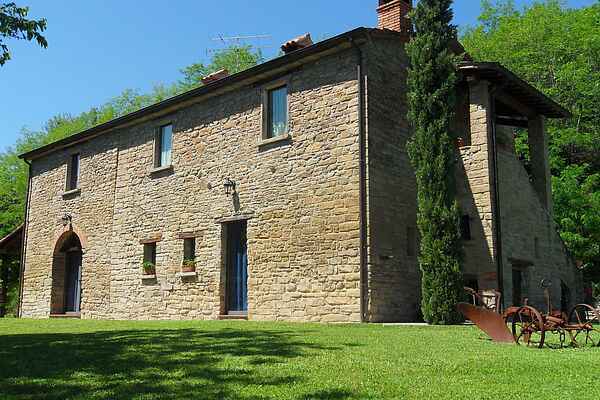 Stone house in the green rolling hills of the Apennines, 300 metres above sea level with a panoramic view of the vineyards and olive trees. There are two apartments on the ground floor, which you can book separately or together. Each apartment has a separate entrance but there is also a connecting door that you can use if you would like. The apartments have been renovated, while preserving the original features of the building, which dates back to the year 1800, and are stylishly furnished. The building is surrounded by a large garden, which is a great place to grill or simply enjoy the peace and quiet. The main building, set among vineyards and olive trees, is about 400 metres away and you can also reserve meals here. The house is located at about 5km. from the town of Modigliana with its beautiful historic center. Other places not far away that are worth visiting: Tredozio, Brisighella, Faenza and Portico di Romagna.